A Flame In Byzantium is the first novel in the Atta Olivia Clemens trilogy by Chelsea Quinn Yarbro. The trilogy is a spinoff of Yarbro's Saint-Germain vampire series, in which Olivia Clemens was one of Saint-Germain's lovers. I've had this novel and most of the Saint-Germain novels on my bookshelves for years, but for some reason, never placed them high on my reading list. However, I tackled A Flame In Byzantium specifically so I could participate in a reading challenge for the 2013 Monthly Keyword Challenge being hosted at Bookmark to Blog. "Fire" was one of the keywords in January's challenge, so since "flame" is a variation of the word "fire," this is what I chose to read. A Flame In Byzantium kicks off during Emperor Justinian's reign in the year 545. During this time, Justinian is on a mission to reconquer and claim Italy from the Ostrogoths, who are currently occupying most of the Roman Empire. Olivia Clemens, who resides in Rome, has decided to relinquish her home to Justinian's troops for their use, as she flees to Byzantium, Constantinople to seek safety under the Emperor. Once she arrives in Constantinople, Olivia finds that her Roman culture and lifestyle are being carefully scrutinized, as the Byzantines are just a little more conservative with their views. While striving to keep her vampirism a secret, Olivia must also find a way to fit in and comply with the city's politics in order to save both herself and her heritage. Readers who are new to Yarbro or even the Saint-German books can easily read A Flame In Byzantium without being fully caught up with Olivia's back-story. Furthermore, readers who are unfamiliar with this period in history will find themselves feeling comfortable with the era after reading Yarbro's author's note at the beginning, which is a duly helpful history refresher. For those who despise and avoid the subject of politics at all costs (like me! ), don't worry: the political battles in this book are fascinating and actually quite joyous to read about. Olivia is a thrilling character because she is modern. A contemporary. Even the nasty banter between Olivia and the women in the court of Byzantium is entertaining and not unlike conversation between today's women in upper echelons. Yarbro's historical research into this time period is impeccable, and it shows through her writing. I have no doubt that the rest of her novels that span across various time periods are also accurate, though they may be embellished for fictional entertainment purposes. If anything, I am intrigued and very interested in learning more about Olivia's past: especially about her turning into a vampire and about the centuries she spent with Saint-Germain. 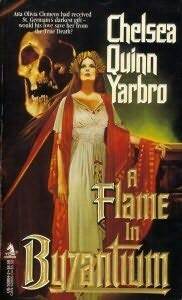 Having been written during the 1980s (way before this crazy vampire reboot phase happening now), Yarbro places the historical fiction element far above the paranormal vampire aspect (which is almost non-existent) in A Flame In Byzantium. The fact that Olivia is a vampire takes a backseat to the rest of the novel, and this book is beautiful for that very reason. 2013 is already off to a great start in regards to good reads! I'm happy to say that I've already got the sequel to A Flame in Byzantium on deck, which is called Crusader's Torch. Following Crusader's Torch is A Candle for d'Artagnan. The first two books in the Saint-Germain series are Hotel Transylvania, and The Palace. What are your favorite Chelsea Quinn Yarbro novels? What are your favorite historical fiction novels? Share your thoughts with us in the comments section below! I've never read anything from her but I'm intrigued to look her up now. I love historical fiction.